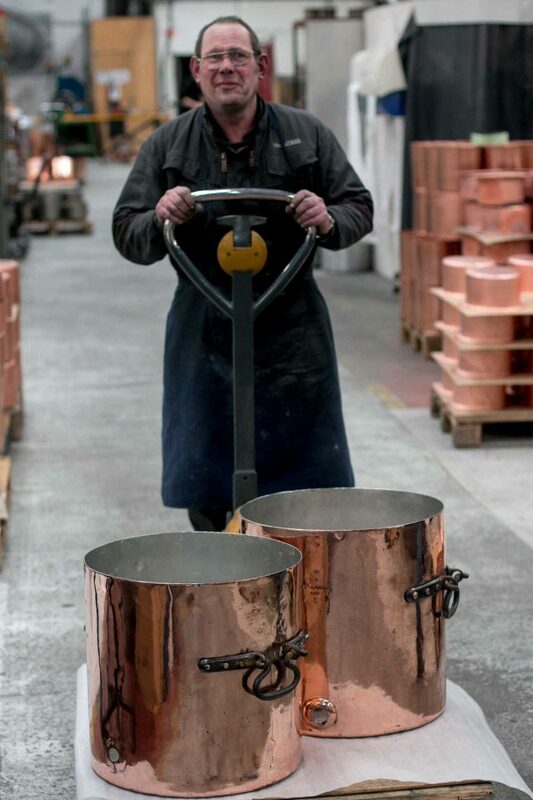 A few hours later, after a restorative café express, once inside the factory, everywhere I looked, there was copper cookware in different stages of production, stacked around the rooms. “Factory” conjures up images of giant buildings with thousands of people toiling away. 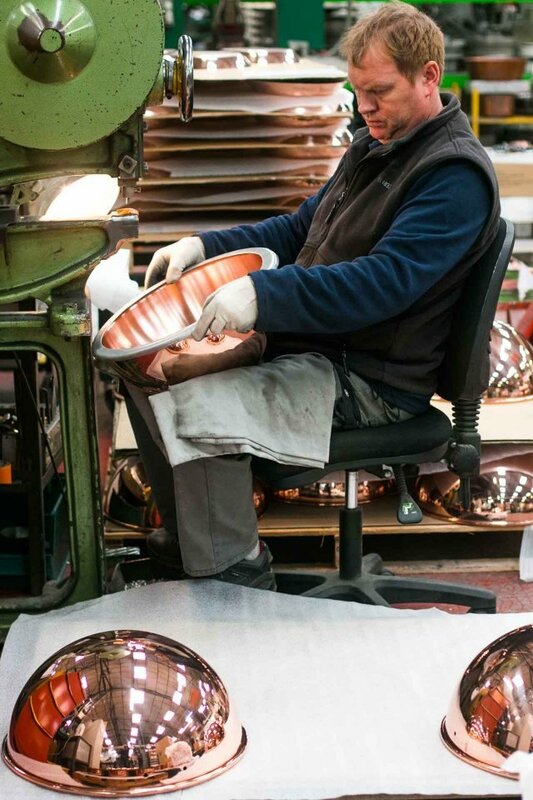 But the human-sized building where Mauviel cookware is made is surprisingly small-scale; fifty four workers working various shifts, bend, press, fire-up, hammer, rivet, and polish their gleaming copper pots and pans, before sending them out into the world. Before I lived in France, I remember going into E. Dehillerin in Paris…maybe thirty or so years back? I don’t recall the year, but I do remember I flew PEOPLExpress and the flights were $99 each way. With the money I saved on the flight, using my kitchen line-cook wages, I splurged on a few pieces of Mauviel copper cookware. On the flight home, we had a very scary experience with excessive turbulence. People were screaming and falling out of their seats, and a few got sick in the aisles. Many thought we were going to crash, but all I was worried about was about my gleaming copper cookware, down in the hold. Someone on the plane later wrote an article about the experience, although I can’t find it anywhere online, but it was about how he “found God” during the turbulence. Whatever higher power that was looking out for us, both I – and my copper cookware – survived the flight. 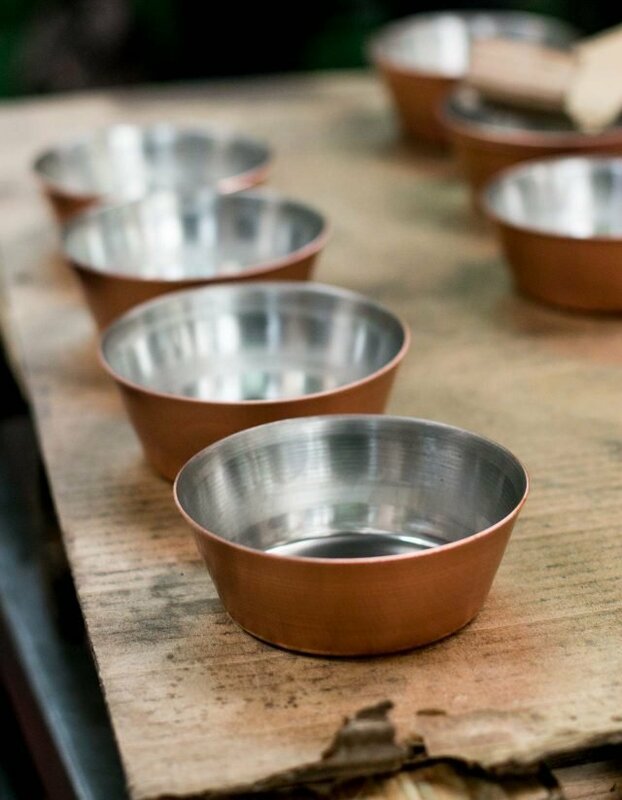 I finally went back to where it all began, in Normandy, where pots and pans were in all stages of production, starting from sheets of raw copper, hammered, shaped, and bent into things like jam pots (above), and potato steamers, (below). 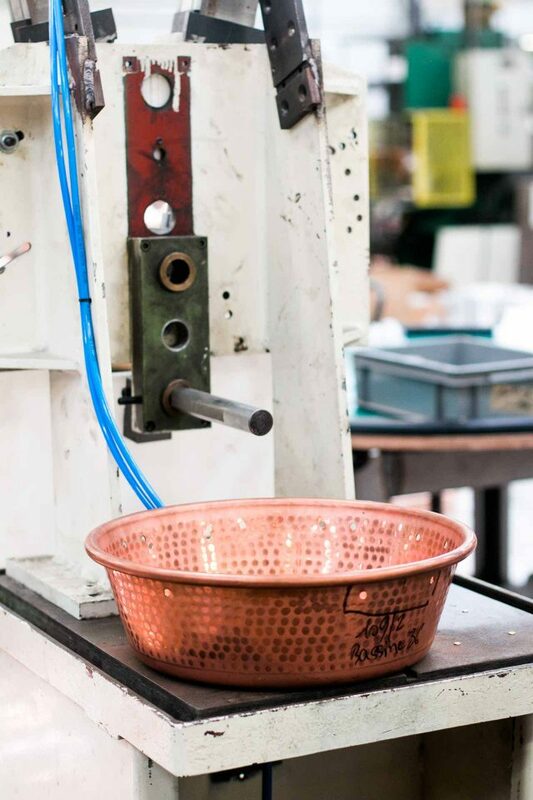 Mauviel has been making copper cookware since 1830. Valérie Gilbert is the seventh generation of her family to run the company. I’d met her at a luncheon in Paris a few weeks ago and she kindly let me spend a good part of the day roaming around the factory with her, and on my own. 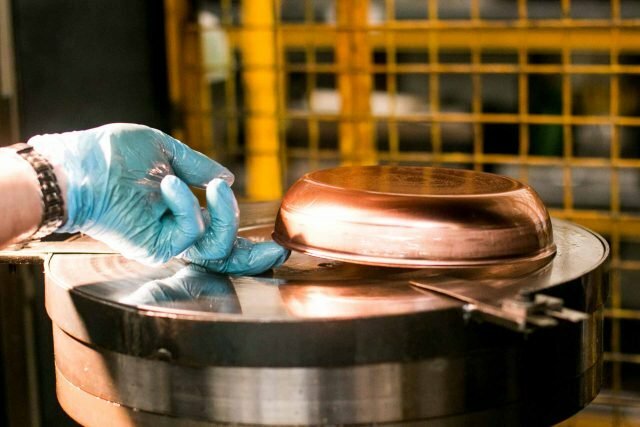 Not only do they make copper cookware, but they recondition and repair it. A giant, heavy braisier had been sent to them to be refinished, and I have to say, that pot was incredibly heavy. I don’t know how the man (who had a few years on me) hefted it and held it against the polishing wheel for as long as it took to shine ‘er up. But I will never complain about my job again. Like a number of businesses in France, Mauviel isn’t just a company. At the risk of sounding like a logo, it’s a tradition. 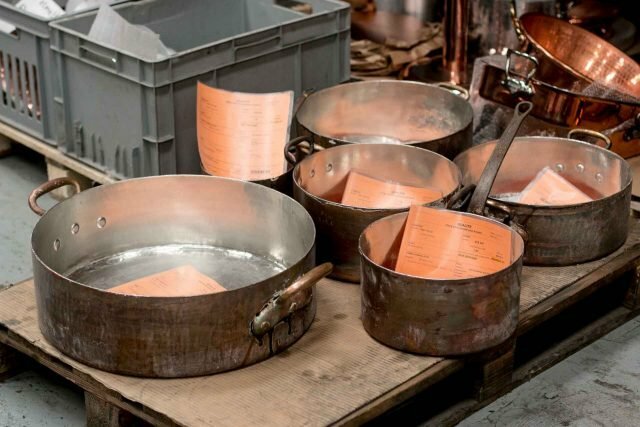 France has a long history making copper cookware. The town, Villedieu-les-Poêles translates to “God’s City of the Pans.” The residents are often referred to as les sourdins, or “the deaf,” because so many had lost their hearing over the years, working in the loud factories where copper was hammered and pounded. The town also has a fonderie that makes bells, and Cornille Havard made the cloches for Notre Dame church in Paris. 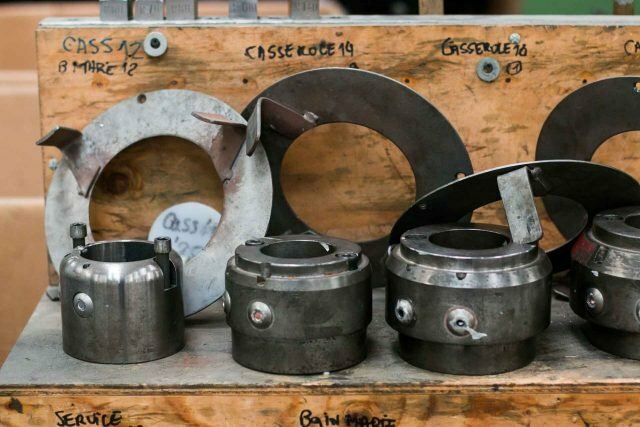 Like everyone at the factory, Valérie is involved of all aspects of the business and inspects various pieces that come off the assembly line, and even pieces that come in for repair or reconditioning. 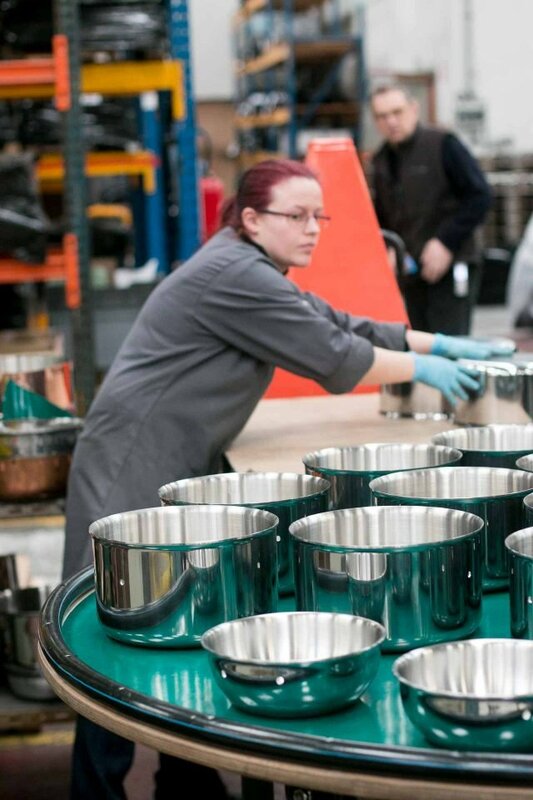 Having inherited the family business, it’s clear that this is her life and she takes a personal interest everything that goes in and out of the factory. You have no idea what goes into making something until you see it made. 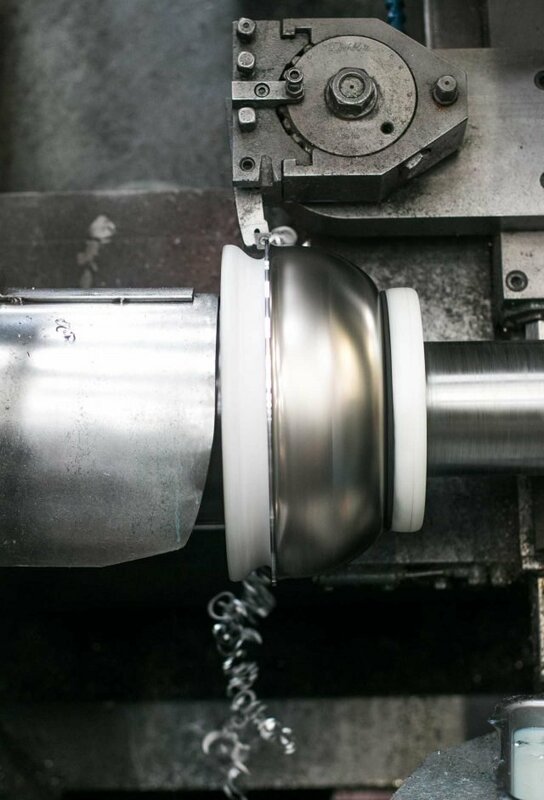 So much manufacturing has left for less-expensive places, that you appreciate it even more when you see people working at their craft so diligently, especially in a country that’s often accused of having a slack work ethic. Everyone in the factory that I met was friendly, and worked diligently at their tasks. While I was on my own, everyone was incredibly nice and open about what they were doing. Theses people are the best at what they do, and were happy to explain whatever they were doing, or show me the process the pieces of cookware go through. Above is the beginning of a turbotière, one of those words (and pieces of cookware) that could only exist in French. It’s a copper pot for poaching turbot. 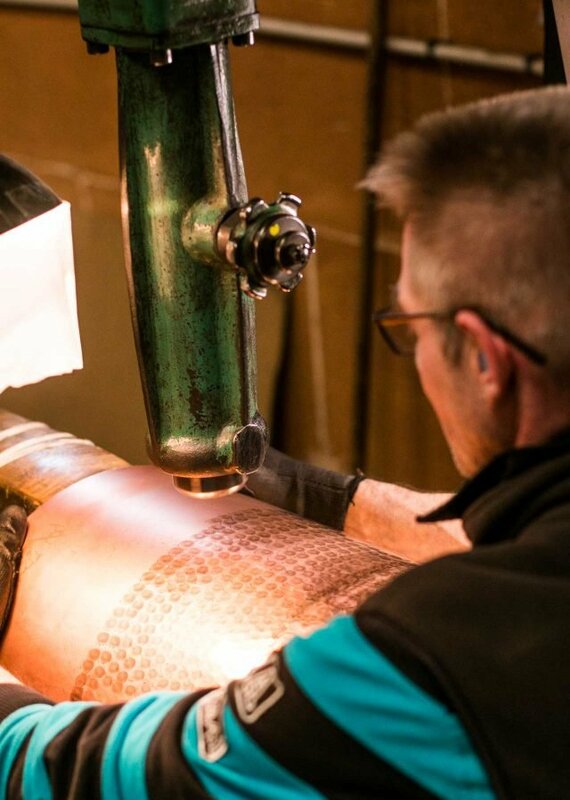 It starts from a sheet of raw copper, which is folded into a rough suggestion of the final shape. 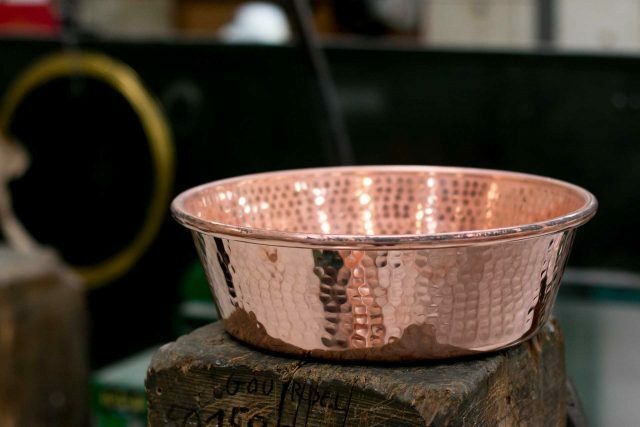 The sides are soldered together, then the rim is hand-hammered closed. Once everything is bent and smoothed into shape, then it’s sent to be polished and wrapped for shipping. 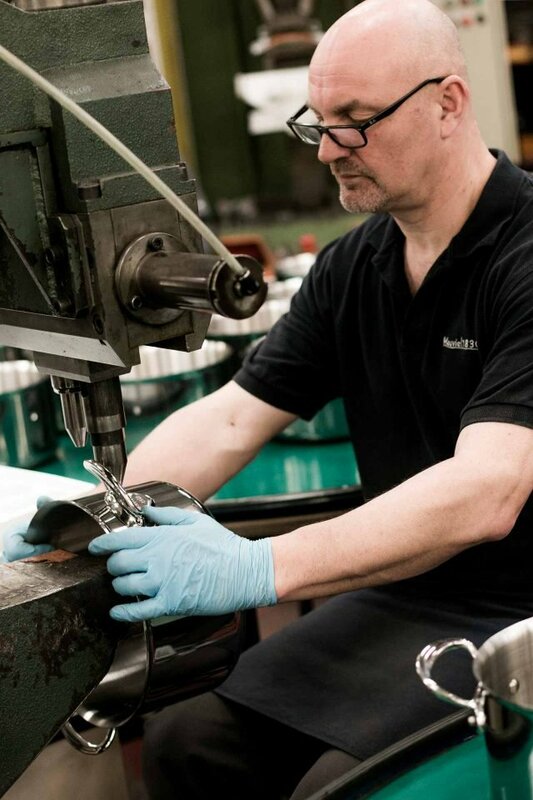 Every piece is inspected as it comes off the line. And when I say “line,” I’m not talking about a mile-long conveyer belt. Here, it was a dozen or so at a time, with each piece being held under a riveting machine, to have the handles attached, as it came off the belt. Mauviel is one of the last companies in France to make copper pastry pots and pans, including tarte Tatin molds (which is the one piece I wish I had brought back to France with me…), sugar pots, and sabayon pans with rounded bottoms and handles to heat and whip the frothy sauce up. But if anyone wants a specialty piece, they are happy to produce them. 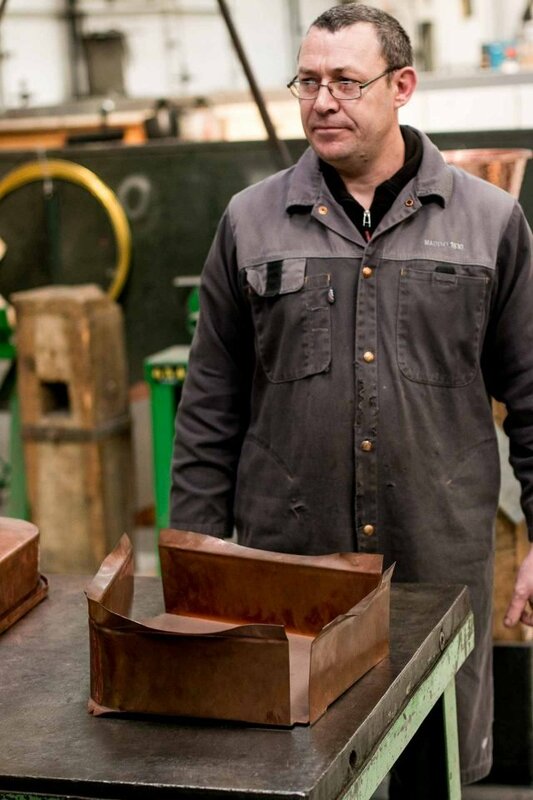 Many chefs request special platters and serving pieces, and when I asked Valérie, “How few will you make?” She said, “We’ll even do just one!” I was thinking how fun it’d be to design a copper tarte Tatin pan that was my own-branded piece of cookware. Then I came back to reality. 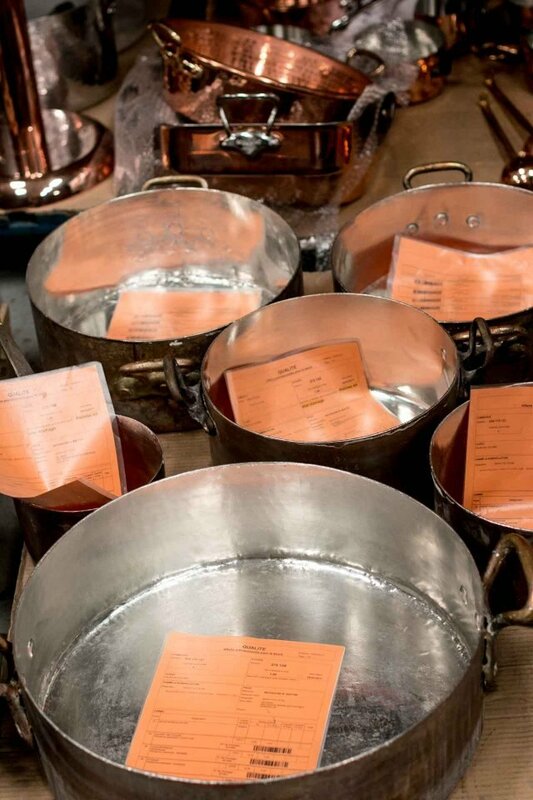 But what really impressed me was seeing these enormous pieces of copper cookware, that came from the Élysée Presidential palace in Paris, that had been sent in for réétamage (retinning). They were spectacular and just trying to pick one of them up was a chore. 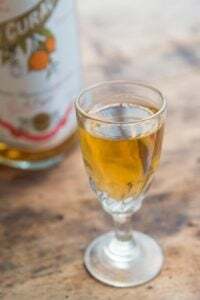 I could barely lift what we used to casually called a ‘rondo’ when I worked in restaurants, which is the name of piece above, which I learned is actually rondeau, in French. C’est comme ça. 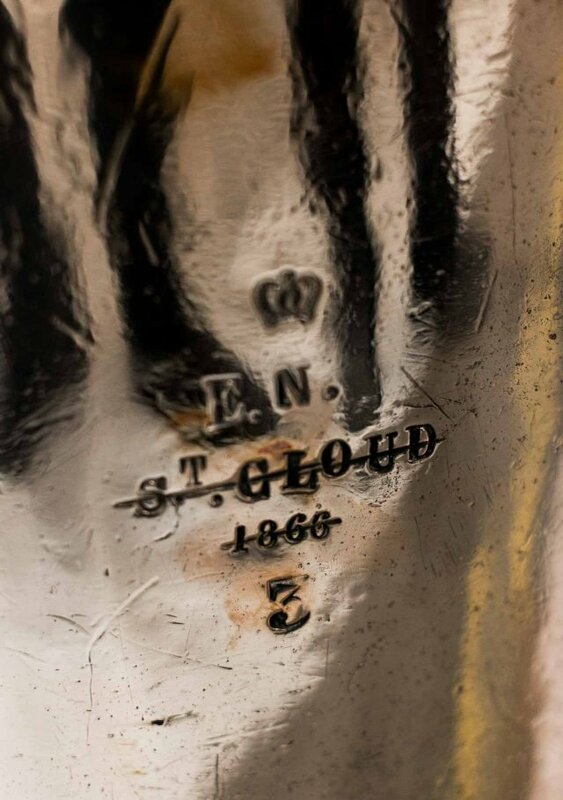 In addition to the bounty from the Élysée palace, two stock pots had just arrived that were stamped with the date they were made – 1866 – which had been sent in for rehabilitation, too. The bronze handles alone were gorgeous, but the girth of the pots was equally impressive. 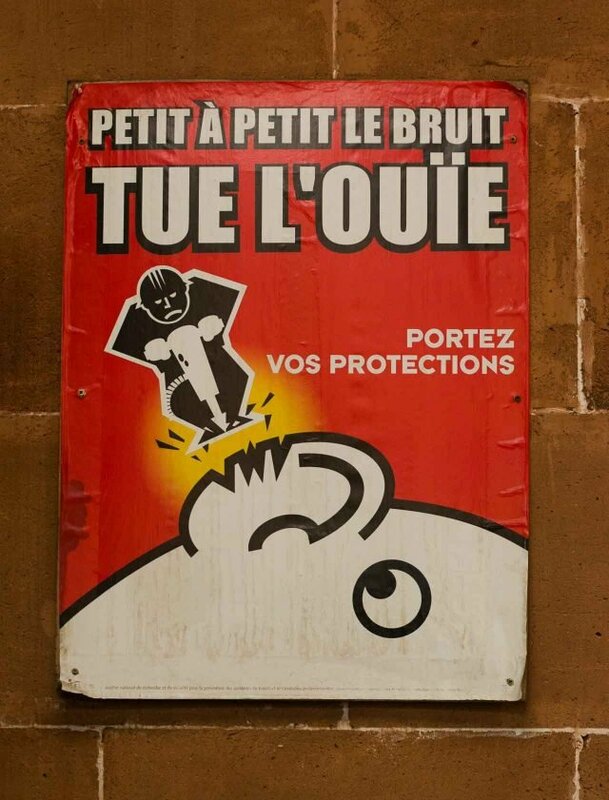 Another bit of French that was added to my vocabulary was martelage – the act of hammering. 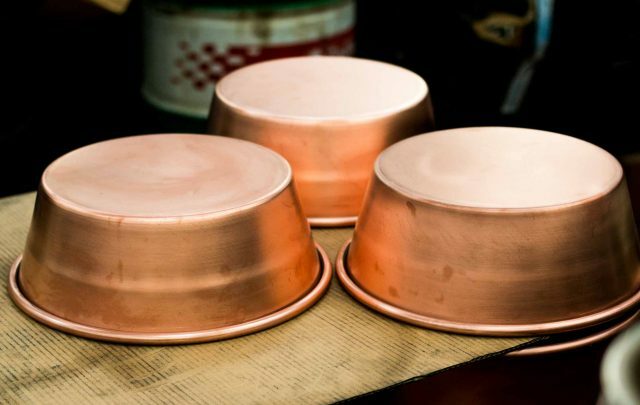 The hammered exterior on copper pots isn’t just for decoration but done to larger pieces of copper cookware because it makes them tougher. This is what made most of people way-back-when lose their hearing, but now there are warning signs in place. 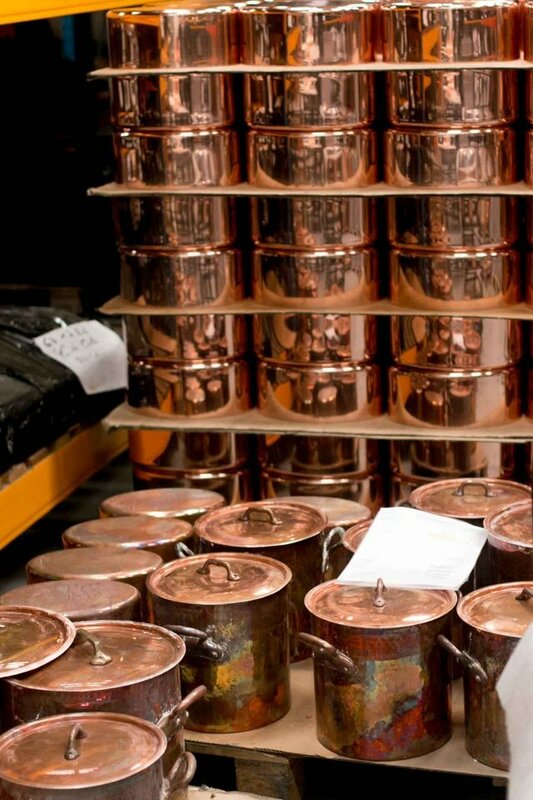 What got me most excited, though, was watching the new copper pots being tinned. The pots are painted with blanc d’espagne, a special coating to protect the outsides, which tin won’t stick to. Then a handful of irregular metal pellets are tossed inside, before the pot is ready to “cook” over an open fire. Seeing that was one of the best things in my life. 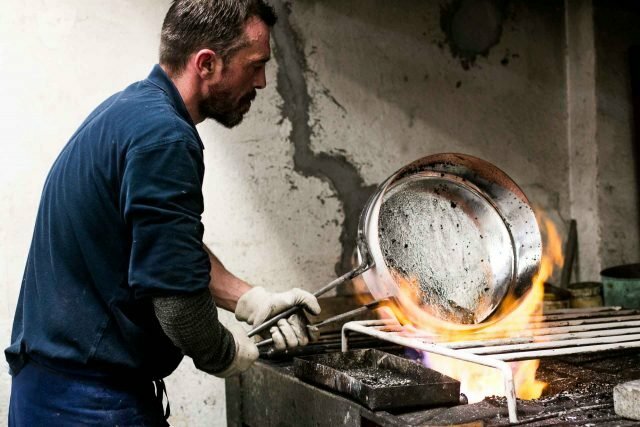 I could have spent a few days watching him melt the metal and coat the pieces of cookware. 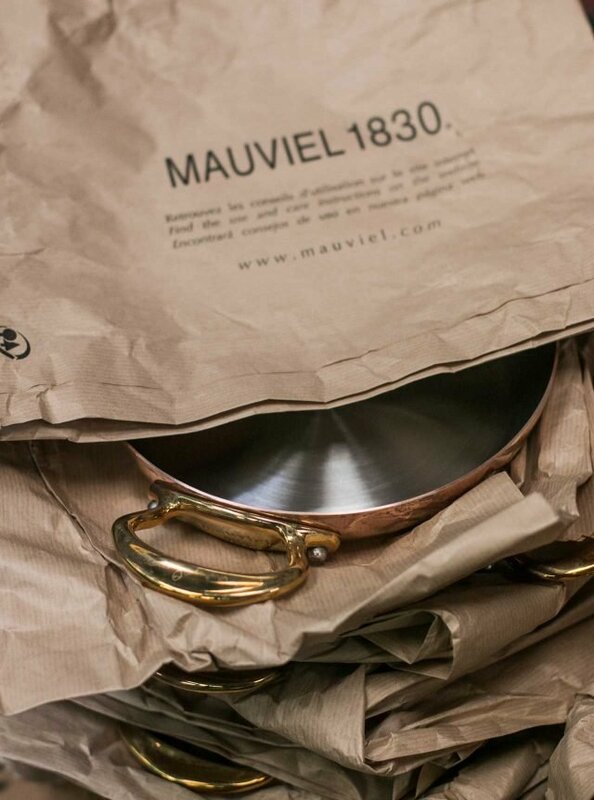 In addition to copper cookware, Mauviel also made pro-quality stainless-steel cookware. As a gift, they gave me this lovely little saucepan that was coming off the line, and stamped my initials in it. By late afternoon, it was time to say goodbye and head to Mont Saint-Michel for dinner. I was exhausted but had a hard time sleeping that night, thinking about all that beautiful copper cookware coming off the line. And wondering how I could get my tarte Tatin pan (and oval gratin dish) back over here. The factory outlet store is open 8 to noon, 2pm to 6pm, Monday through Friday. You may wish to call before visiting to confirm opening hours: 02 33 61 00 31. 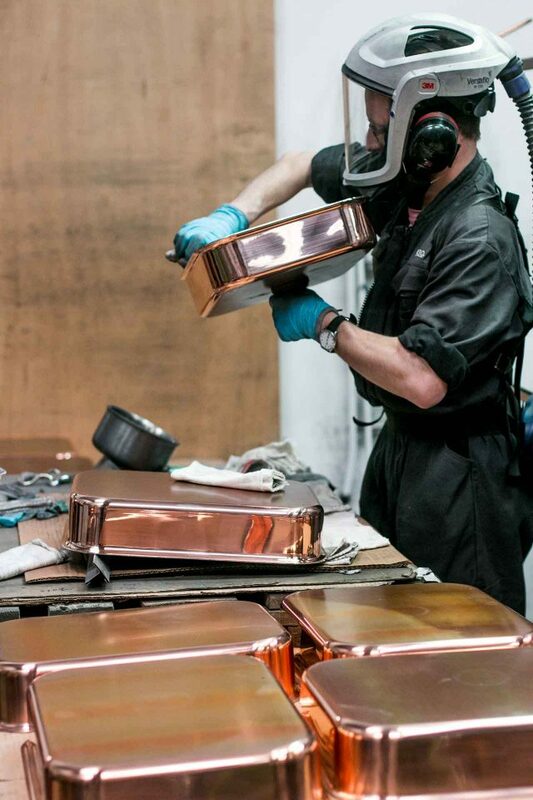 Mauviel Copper Cookware is available at Williams-Sonoma, Sur La Table and Amazon. This is a fantastic tour. The biggest surprise was that martelage is for strength and not just for aesthetics. 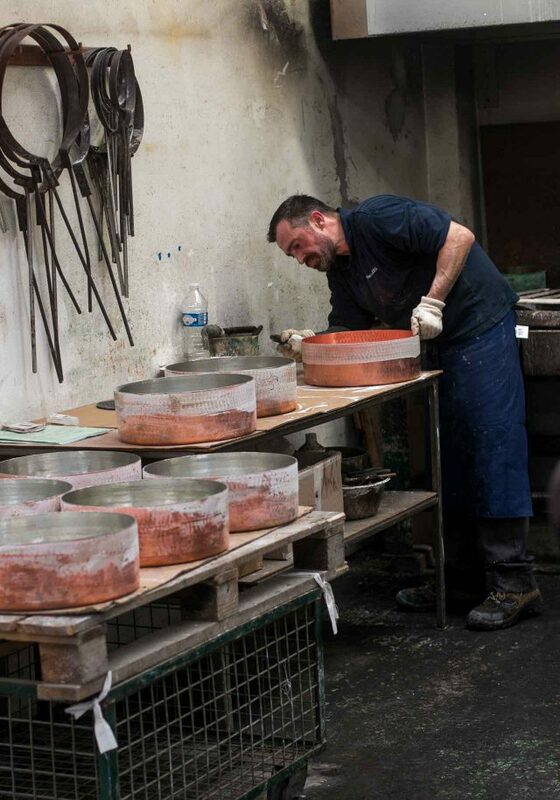 There are copper pots at vide greniers all the time; they last forever. 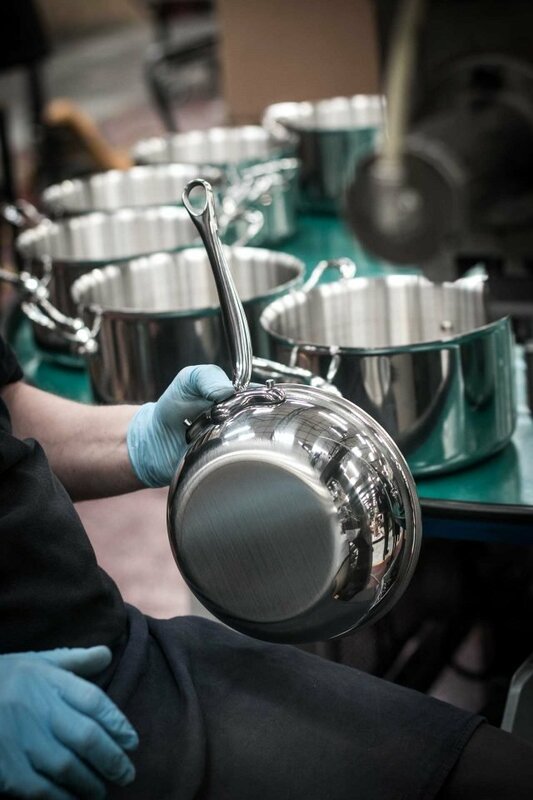 Another made-in-France cookware line, Cristel, has the motto: Buy once for life. So beautiful, all this copperware. I use a copper bowl for whipping egg whites! Forgive me my ignorance, but why are most pots and pans tinned on the inside? (Why not keep it as it is: copper?) Thanks David! 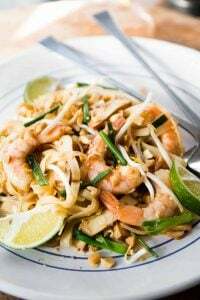 Copper is highly poisonous with most foods! Actually, saying copper is mildly toxic would be more accurate, but mild toxicity over time builds up and can cause serious damage. One of my favorite memories of my first visit to Chenonceau(?) in the ’70’s was the kitchen with all it’s gorgeous gleaming copper cookwear! That kitchen! I was in awe. Mickey: I believe it’s because copper is reactive when used with certain ingredients, so that’s probably why they are tinned. And tin is food safe? It clearly must be but it seems like such a soft metal. But as long as it’s not aluminum. I’ve stopped eating jams and jelly’s unless they’re homemade because the taste of aluminum from the commercial pans they’re cooked in is just overwhelming. And I hate to think what it does to people’s bodies…but tin must be better? I was thinking the same thing *jilly*! I have always believed that tin IS aluminum. My Mother had aluminum pans growing up but got rid of them when my brother, who is a Dr. told her they weren’t safe to cook in, especially acidy foods, such as tomato sauces (she is Italian). Tin is very safe to use, and you are right, it is a very soft metal. 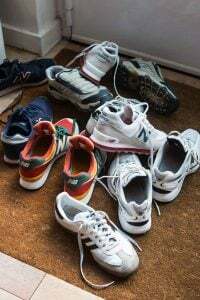 Tin starts to blister at approximately 460F, if it blisters it needs to be retinned. Hello! 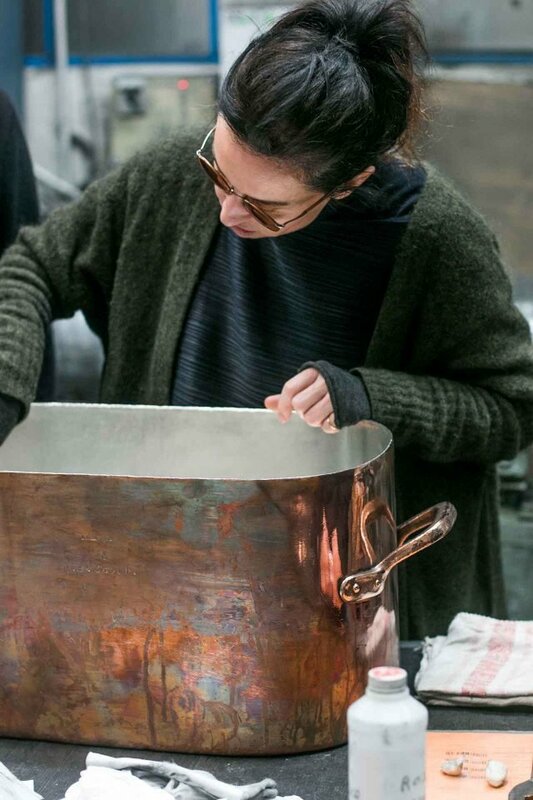 The man at Dehillerin who retinned my pots told me that if one did not let the food *cool* in unlined copper (or pots with worn linings), there was no problem. He may be right, but I feel safer with the tin. 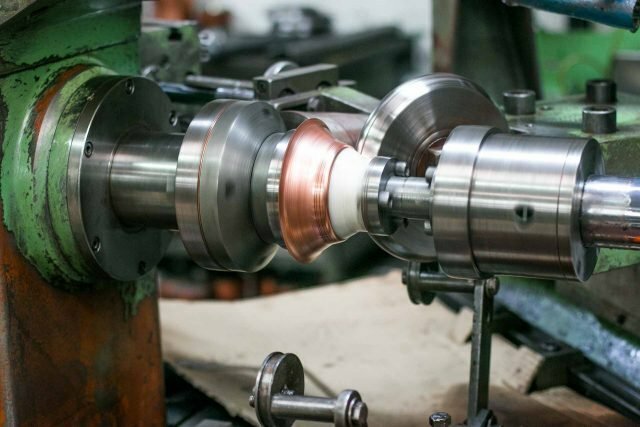 I have always wondered: is it better to get copper lined with stainless steel (which reduces conductivity, no?) or with tin, even tho’ they need retinning every 5/6 years or so, depending on use…? Great article, thank you very much! Merci! That makes sense. I do know not to mix cream with the whipped egg whites in the copper pot: it will turn green(ish) apparently! What a wonderful post! I have long-admired Mauviel pots and pans. 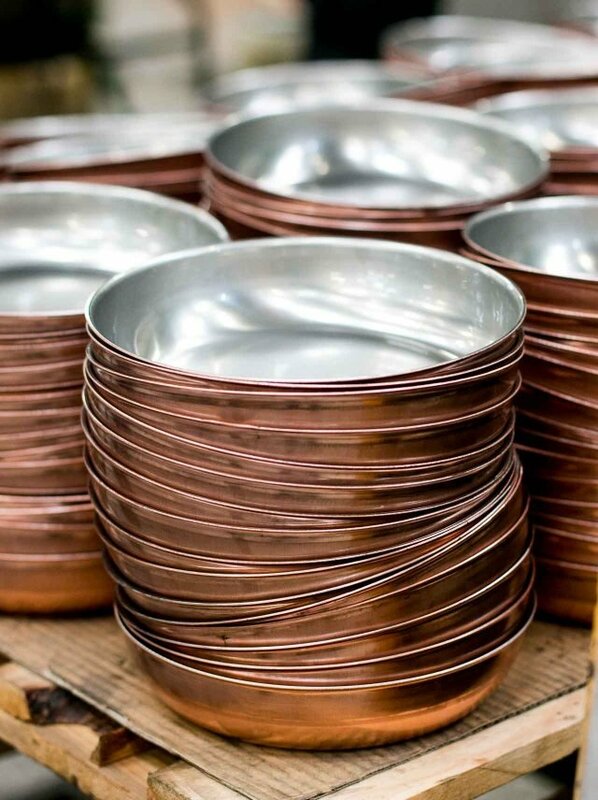 Although I do own a few stainless pieces, it’s their copperware which is truly a work of art. Thank you for the virtual tour! Wonderful wonderful post! Thank you! David, that was surely a most memorable experience! After reading your post I went and fondly looked at the few treasured Mauviel pots that I have with an even warmer appreciation of their history! Thank you for sharing your visit! Fabulous photos! I have deep pan envy. As I was reading about the process, I found I kept saying, “that is SO cool” over and over. Oh, what I wouldn’t give to have been there with you, David. I love Mauviel cookware. My favorite ones are my 20 canele molds, the first Mauviel product I ever purchased. I just used East Coast Tinning for retinning several copper pots and they did a wonderful job and were easy to work with. I can second the recommendation for East Coast Tinning. They did a great job on a piece for me last year. 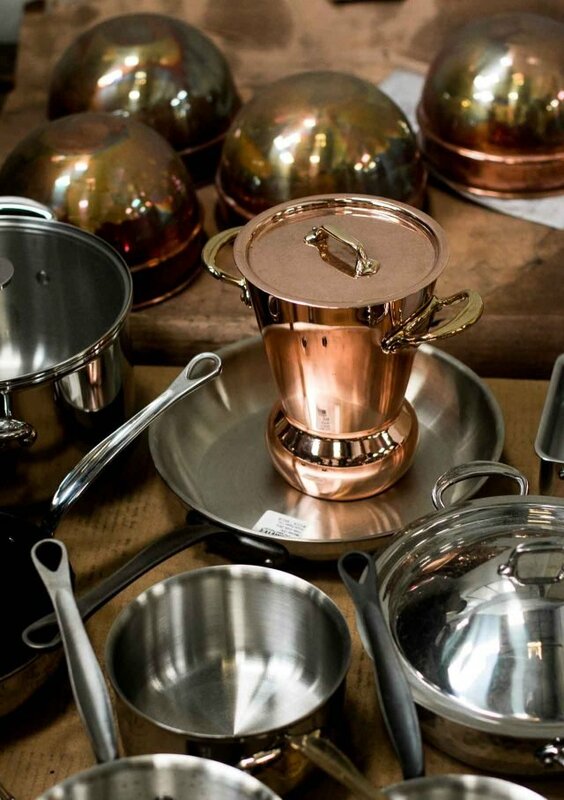 They have also started to offer vintage copper cookware on their website for sale. DL, Thank you for the mention! …and a great piece on Mauviel. …to Ruth and Bobbie, thanks for the kudos! Love your post. I was drooling all the way through! Makes me want to get online and order a copper something! thank you. wonderful tour. I have many copper pieces and some old ones that I do not use as they need retinning. I have also purchased some with nickel and stainless on the inside but I don’t think they cook like the tin lined ones. loved your videos too. now I know why those little canele molds are so pricey. lots of work. I have followed you for a number of years and this is one of my very favorite posts! I have pieces that I purchased at Dehillerin in Paris and Sur la Table here at home. Thanks for documenting this wonderful company. The potato steamer is an especially wonderful piece..how lovely to just display it. The best post yet! Eons ago, I bought and brought home from Dehillerin a med. sized turbotière. Never found a turbot to put in it, but it was great for a huge batch of Diana Kennedy’s Barbacoa de Pollo, but baked in my oven. Great post and photos! Does the factory outlet carry first quality items or are they “seconds” with flaws, etc. Thanks! Beautiful works of art!! The sheen. I think I’m the person that scored the gratin dish! Great article and photos. Ha! Is it too late to get it back? I’ll trade you the gratin dish for a tour of Paris! I enjoyed this report of your visit to Villedieu-les-Poêles, which brought back happy memories of two visits I made there over the years. 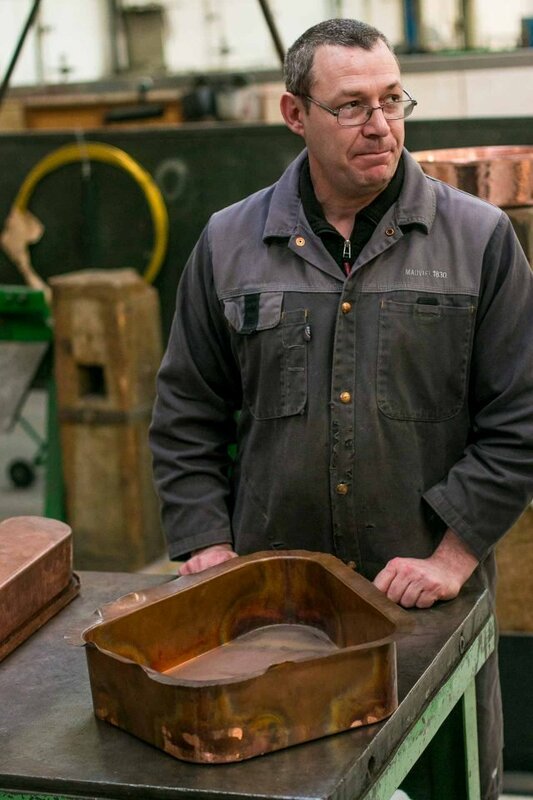 I still remember the mother and son team who worked in the shop in town and told me (an American), with great gravity, not to put my copper pots in the dishwasher! The fonderie you mentioned is also an interesting place to visit. I was there to see a sculpture they were making in bronze for a WWII monument which honored the 101st Airborne for a battle at a nearby bridge in which my uncle participated in June 1944. He survived and was honored with the Légion d’honneur. 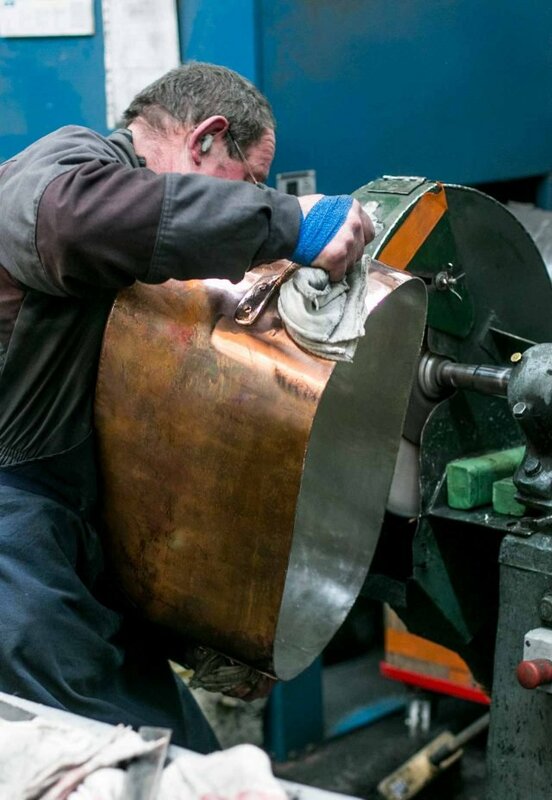 But I especially enjoyed watching the artisans make a huge bronze church bell. They still use the same technique used in medieval times (which involves a large form made from straw and manure). I bought a small hanging bell there to use as a doorbell on the outside of my house here in the middle of nowhere in Northern Vermont, where we still have a foot of snow on the ground! I miss France and all the time honored crafts which are still in production. I really wanted to go where they make the bells, but I spent so much time at the factory (I didn’t want to leave!) – however had to get elsewhere that night. I really liked the town of Villedieu-les-Poêles and will probably go back and spend a few days there, and visit other places. This is great and very timely! We are going in June – my family are Sourdins that emigrated to Australia a long time ago. Are the factory shop prices good? Been following you for ages and spend several months of the year in Paris so really appreciate your blog about things around Paris. I was privileged to visit & have a factory tour many years ago when I lived and worked in the region. 30 years ago I used to assist in cooking classes in The Perfect Pan in San Diego. I would get paid with gift certificates to use in the store. I saved them up and purchased a number of pieces of gorgeous French copper pots. Last year we moved and I now have the pots in a cabinet in my office. I took a photo of the pots and sent it to all my children telling them that if I should suddenly die, under no circumstances should they throw out the pots. No instructions on the art or jewelry, just the hand made French copper pots. Thanks so much for this post — it’s so cool that you were invited into the factory! Midway thru reading, I ran to check the brand of my copper saucepan purchased at E. Dehillerin, and am thrilled to see it’s Mauviel! But I’ve been afraid to use it, because the salesman told me to take great care to not get the pan too hot or the tin lining would melt off! I WANT to use it (tho it looks great hanging in my kitchen)…so just how careful do I need to be?? Never put it on the fire without something in it, use low to moderate heat, and make sure the pot stays below 400 degrees. I would love to stop at the factory on my way to Mont Saint-Michel in May, but I just realized I have an induction cooktop. The pots won’t work, will they? I guess I could always buy something for the oven. C’est dommage. Super post! Because I was in the right place (Dehillerin) at the right time (exceptionally strong dollar) I have a lot of Mauviel copper cookware (though almost all stainless lined with cast iron handles). Superior product, makes a real difference in the kitchen (although I’ve never quite figured out how I’m supposed to use the pommes Anna pan). Enjoyed this opportunity to see inside the works. One of my favorite posts ever. What an incredible experience, tinning – who knew! As a granddaughter of an Irish-American silversmith, I share your interest and excitement in the process and mastery. Much thanks for sharing! I found two used copperbowels with handles ,what is the best way to make them shine again ? Maas polish and elbow grease. 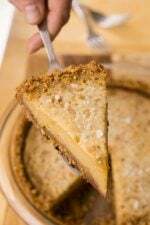 You can also use Bar Keepers Friend, and some people swear by lemon juice and salt. Forgot something: that piece from 1866 appears to be stamped “L.N.” and St. Cloud. 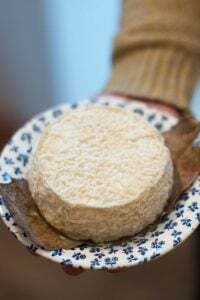 Perhaps it came from the kitchens of the Chateau de Saint Cloud while Napoleon III (aka Louis-Napoleon) was in residence there. The date is right. David…I loved this post!! And it triggered the most wonderful memory that happened to me during that awful time in our history, 9/11. I was in France at the time and planned to shop for copper pots at Dehillerin. I was all geared up for an intimidating experience. The gentleman who greeted me as I entered the store could not have been more kind. In the end, he took me down into the basement,….brick walls lined with sagging hand hewn wooden shelves piled high with copper pots and pans. 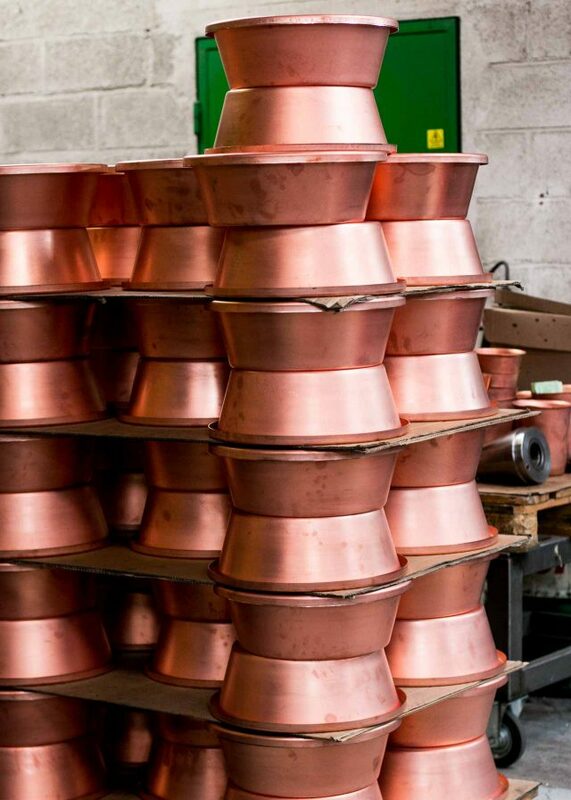 Rows upon rows of gleaming copper…he left me down there to browse. And then returned to carry upstairs a tarte tatin pan, a double boiler for melting chocolate, a sauté pan, and a gratin pan. 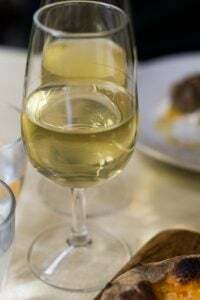 He carefully wrapped it all and as I stood at the counter, I read, in English, a message of sympathy “to our dear American friends” written on lined yellow paper and taped to the counter top. He graciously escorted me out the door…and, yes, I had to call a cab to get me back to the hotel with the load of pots. I’ll never forget his expressions of sorrow and empathy for what had happened to America…still using the pots sixteen years hence. Cannot remember how I got them home on the plane. I love copper ware! 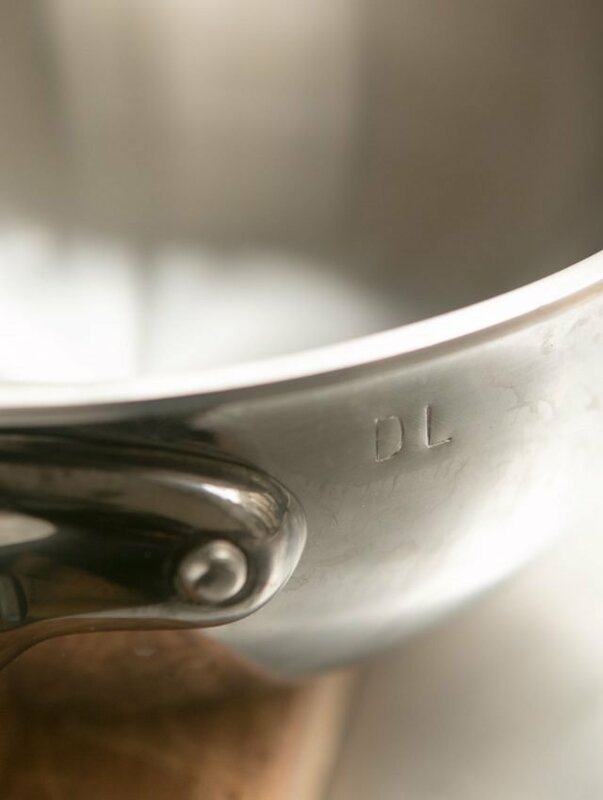 I own one of those French jam basins – purchased in 1972 when I opened my first restaurant. At the time, I could afford to outfit the kitchen not only with all the copper pots I wanted, but also with a custom-made copper exhaust hood! Later, when I lived in Mexico, I visited Santa Clara del Cobre, where the copper shops are. I still have a giant turkey roasting pan I bought there. Were any of those photos of Tarte Tatin pans? I would have loved to see one (and maybe I did, but just didn’t recognize it). David, this is my favorite post/visit you’ve ever done! I’m lucky enough to have a few Mauviel pieces from Sur La Table, and picked up the cannele molds from Dehillerin a few years ago. If I ever get back to France, I need to go to the Mauviel factory. Thank you!! Those shiny kitchenware all lined up look pretty. And this post is very educational. I didn’t know about that “martelage” process to strengthen the metal. Nice one! Wonderful post, so interesting. I always look forward to reading your blog. Awesome post! I would love to read more like this with all of your fabulous photos. 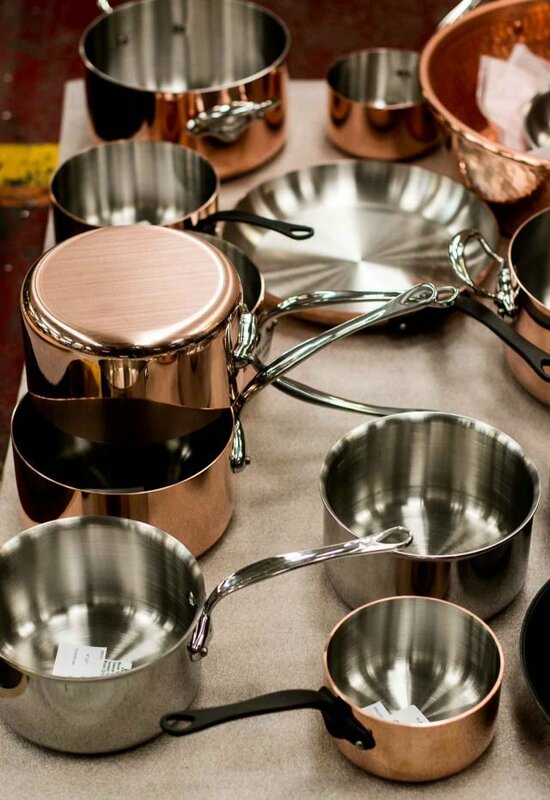 I’ve been lusting after a new set of copper cookware for quite a while now. I’ve used East Coast Tinning. They did a good job. They also sell antique copper pots and pans and make their own new ones. All very pricey. Occasionally I find copper cookware at Marshall’s, including a Mauviel round bowl for beating egg whites, a Ruffioni Dutch oven with beautiful brass handles and lid grip, and a variety of Alsatian made pans, hand hammered and very thick. Very reasonable, compared to their retail prices. Wonderful post! 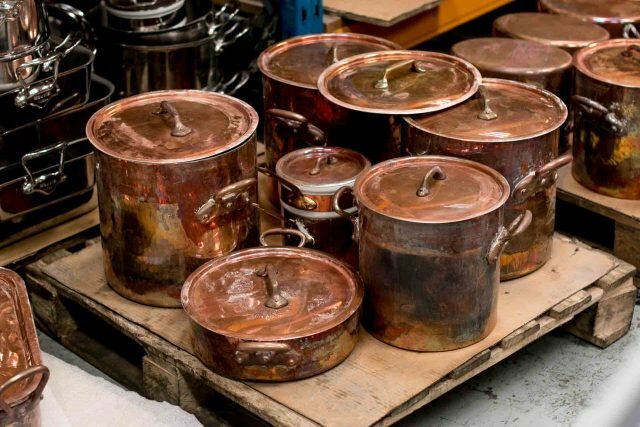 I began my copper pot collection in Villdieu-les-P, continued it at Dehillerin, and have little by little replaced the tinned pots and pans with Cuprinox stainless lined, heavy duty pans. Is Cuprinox made at the same factory as Mauveil? The jam pan I recently bought at Dehillerin has been used and used -love it. Brought it back in my suit case and through the kindness of a lovely French attendant (after I explained what I was going to do with it) let it pass despite being very overweight! Beautiful. Loved every picture. And a pot with your initials, the best! I love my little mauviel omelet pan from dehillerin! This is among your most envy-inspiring posts ever. I WANT one of those tarte Tatin pans. 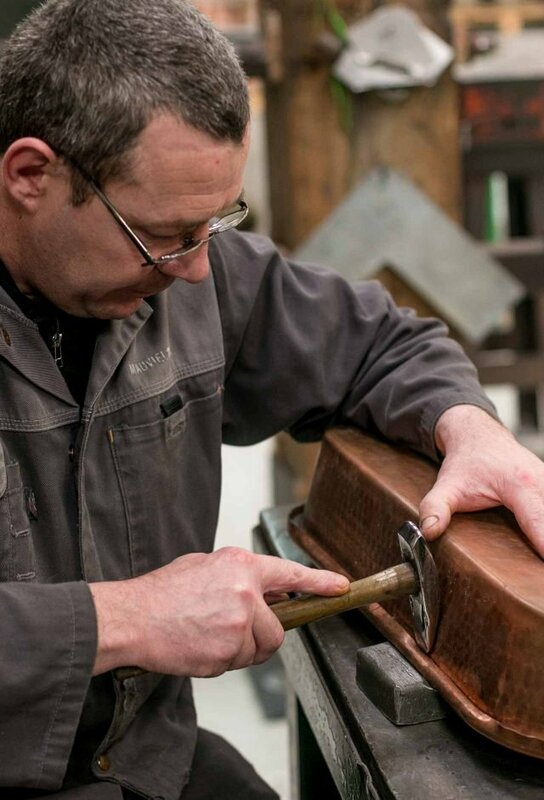 I love French artisans – they have all the confidence their expertise gives them. Such a lovely read – and the photos are touching, somehow. It’s clear you had a wonderful day. Ta. True mastery of a craft is sadly rare in this age of industrialisation and robotics. Most people do not appreciate the time, attention to detail and expertise that make up a fine piece. Nor are they willing to pay the price asked for high quality work. Instead, we a have a throw away culture. This was an excellent and fun article. I learned something new and my interest was piqued to learn more, and, best of all, you have helped to promote a small manufacturer. Isn’t it better to go into debt for a while and have a piece of working art that you can hand down to your great grandchildren then to purchase 10 cheap pots in 10 years? Nice work and thanks so much. A friend who knows I love copper stopped at my house a few years ago and handed me a Mauviel copper 3 qt pan. She had just picked it up at a yard sale for $2. I nearly fell over. Use it often. Love it! On my list for our return trip to Normandie in September. Agree with all the others that this is one of your best visit posts. I too have memories of rooting around in the copper section of Deshillerin. This is the reason I love reading your blog. I enjoyed this post tremendously. Thank you! 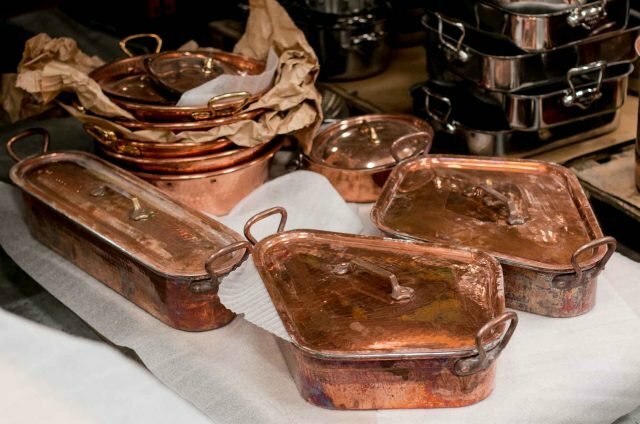 Could you kindly explain the benefits of cooking with copper pans and pots? The beauty is obvious, but I must admit i’m ignorant as too their advantages. What a fun post David! Loved the photos, Its was like being there, as most of us will never have the privilege. I went to my kitchen to dig out a big copper round gratin pan I used for paella years ago. Unfortunately it is not Mauviel but stamped Williams-Sonoma. Still, a beautiful, and expensive, pan. I remember the celebration dinner I cooked as an excuse to buy it. Thanks again for a wonderful post! Hm, I wonder who made it for Williams-Sonoma? Mr. Williams was not one to get cheaply made cookware. I wonder if you could find out?! Thanks for a really great story . I have read it several times and have enjoyed it even more. This is one of your best! I would love to do the tour. I have a couple of the stainless pieces. I have had very good luck with copper cleaner. I use Twinkle but I’m sure many brands would work well. Bach in 1985 I too bought about 14 pieces on copper cookware from E. Dehilleron. Had the same sameday experience — walking out of the store we made it across the street. Realizing our mistake, back to the store to have them shipped. Still have all, including two gratin pans. They did an excellent job on a number of ours. Thank you for the terrific entry. The factory tour makes me so jealous. I’ve been to the Villedieu-les-Poeles — for others wondering, the factory store is just outside of town. If you are driving in Normandy, it’s not far out of your way on the route from Bayeux and the D-Day beaches and Mont St. Michel. There is also a museum and artisan workshop in town (as linked above — the one with the shop in Paris) to go visit — and many shops selling copper (some, however, with imports, I was warned). I can also recommend Rocky Mountain Tinning, as linked above. They beautifully restored my vintage stockpot with fresh tin and a polish. We did the same tour plus video 20 yrs ago. We bought 3 casseroles lined with stainless steel as I didn’t think re-tinning would be easy. Still my everyday pots and pans although I don’t have them on display these days. Pretty spendy in the day but worth every penny. Turbotiere! The very existence of such a pot is why I adore the French. Beautiful post David, thanks for letting us go inside the wonderful world of copper. Love this post! Thanks so much for all the pictures and sharing. Oh, what a trip to copper heaven.Looking at all these beauties makes me reach out my hands to hold and admire each and every one of them. Great to have the mail for retinning inquiries – I have a beloved bain marie pot that I didn´t take care of as much as I should have, thinking of sending it to rehab right now. Thanks for the hint! I felt like I was with you drinking in all the copper beauty. This post mirrors the Le Creuset factory post awhile back.So pleased people still craft useful & lovely things that are appreciated. I treasure my one old hammered copper piece along with the newer ones. Thank you for transporting me again to France! 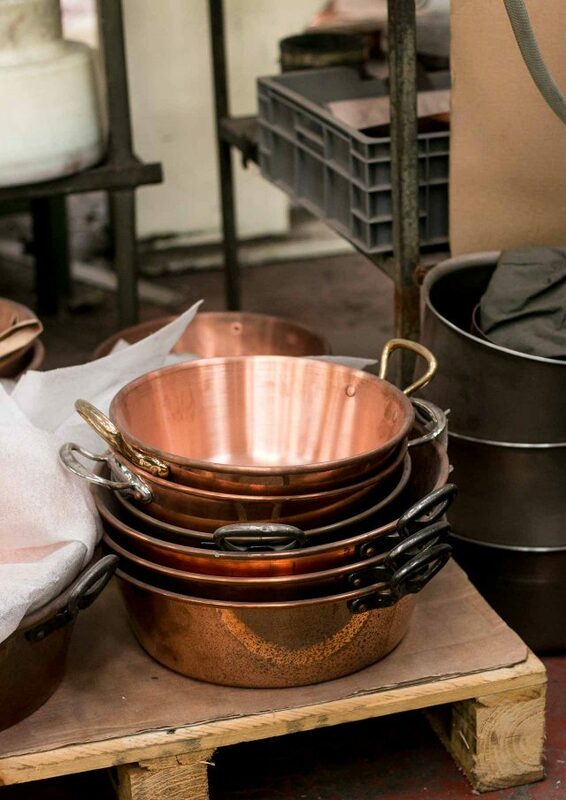 I have been lusting after their copper cookware for years. When I buy my place in Provence, there will be a road-trip up to Normandy to get a set for the house. 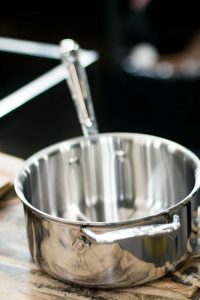 I wrote Mauviel (France) to find out how to condition the pans with stainless interiors prior to use so that food does not stick to the bottom but never got a reply. I have two of these wonderful pans that I don’t know how to use. 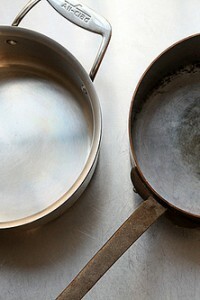 Daniele, I have several stainless interior pots, one a Mauviel and one an All-Clad. 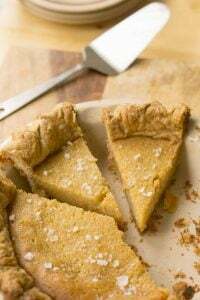 I have not done anything to season them, however when I cook I let the pot warm up first, then add oil/butter and then when that is to the desired temperature, the food. I use a bit of water /stock with things I wish to steam. I even steam eggs in my Mauviel. They clean up like a dream. Once the pans are cool, I add cold water, then I use a plastic scrapper and maybe a bit of Bartender’s Friend. I rarely have an issue. If I do, a teaspoon of cream of tarter in water, in the pot, simmered for 20-30 minutes takes the most stubborn crud off. Hope this helps!! What a treat this post is. Thank you so much, David, for lifting my spirits with your gorgeous pictures and lovely prose. Enviable tour! A few years ago I made a pilgrimage to Dehillerin with an empty suitcase and came back with two fry pans, a saute pan, a saucepan, and a tarte tatin. On your tour, did they happen to elaborate why they’ve discontinued the cast iron handles? I love my pieces and it’s almost impossible to find the remaining pieces to complete my collection! I did see some handles that looked to be cast iron at the factory (I took a picture of them, the 3rd one in the post) but not sure what they are attached to. I think some of the changes may be made because of the heft and weight. 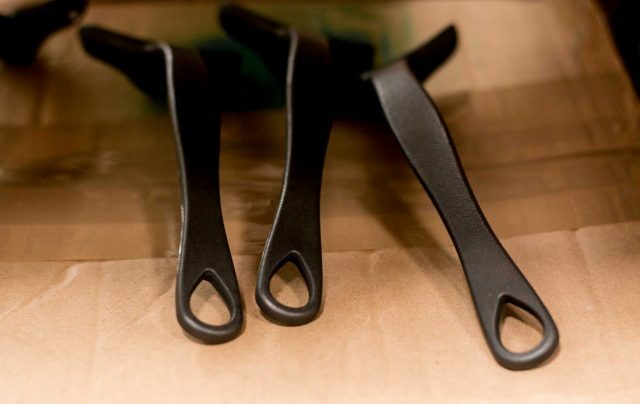 Heavy pans are harder to lift for people, which may have prompted the change in materials. What a fabulous post and a great experience. 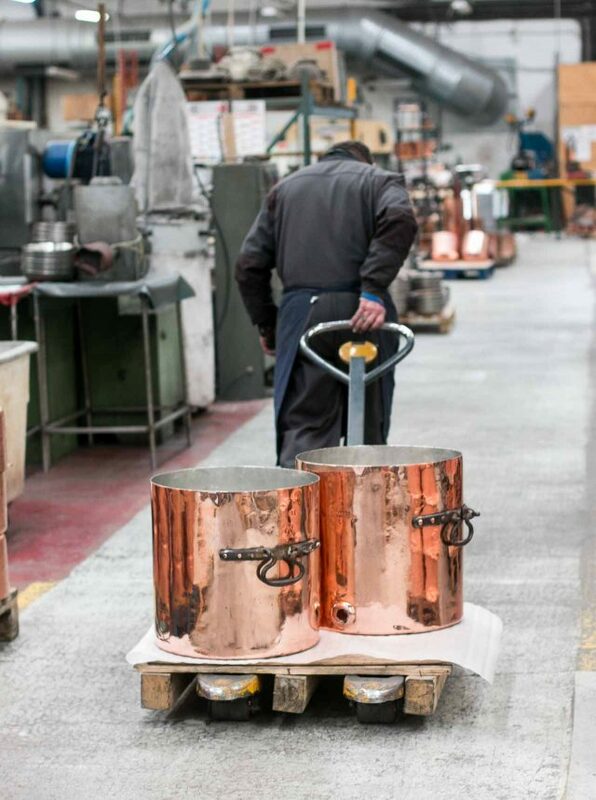 Those copper pots and pans make me quiver! Every year the Emile Henry/Mauviel warehouse in Wilmington Delaware opens to the public with discount prices. Every year I brave the lines and add to my collection! Fun to see where they are made. The handles are still cast iron, but now with an electroplated finish. I too have had pieces re-tinned by East Coast Tinning and would recommend. My pieces looked brand new when returned to me. Wonderful pictures here David. I have a set of graduated sauce pots – Dehillerin, 1978, heaviest chef’s grade, hammered copper with tin lining. Used very little. Packed in box for quite a while. I believe there are 3 sizes. 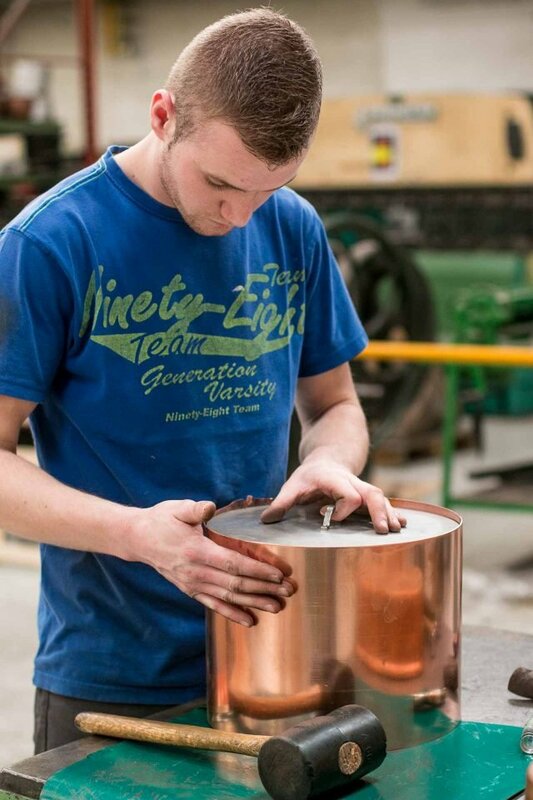 Each has a flat disc-type tin-lined copper lid with the same iron handle. Copper rivets hold the handles on. Also have several gratins, a handled pot that is probably 8 qts or so, some saute pans. The latter are smooth finish copper with tin linings,brass handled. The 8 qt. pot has a regular lid with brass handle on top. I still remember Dehillerin, going downstairs (?). Helped to buy by one of their well-known cranky salespersons (they must get tired of wide-eyed, know-nothing Americans like I was). The experience of being there and buying these lovely things was unforgettable. I am hoping to find a buyer in Southern California as the price of sending these anywhere is astronomical. Forgot to mention that the sauce pots have their heavy iron handles. Not the black-looking handles they offer now. Everything on their site looks quite different. Thanks for writing and sharing this wonderful post. What a great idea!!! 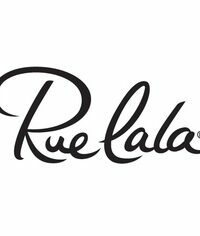 Some organization that supports a cause both in the US and in France. OMG! OMG! this is the very BEST post – obviously you have made a lot of readers happy with it. I bought my own vintage copper jam pan last summer to make jam from an abundance of local plums. Got mine from France, on the Etsy shop Seriously Gorgeous, (which it is).Although the shipping cost as much as the pan, not 1971 in postage either! but still half the cost of a new one at Williams Sonoma. I love it and look forward to more jam making this summer. Glad to know the hammering makes it stronger, mine is on the bottom which is more work to clean, but would look pretty if it hung on the wall. Thank you for this virtual visit! I enjoyed your visit to the Mauviel factory, and the video as well, though I would have loved to see the fluting of the cannelé molds. I am a die-hard francophile and I derive a great deal of pleasure out of your blog. Keep up the excellent work! Thanks for this absolutely wonderful and extremely informative post. Complimenti! No wonder they r so expensive! I treasure my small set, but I believe they r lined w stainless steel. A friend left her copper pot cooking on the stovetop while we went to the movies ! I’ll never forgot the bubbling tin in the bottom of the pot when we got back.